We are back with week 2 of our fall style collaboration! 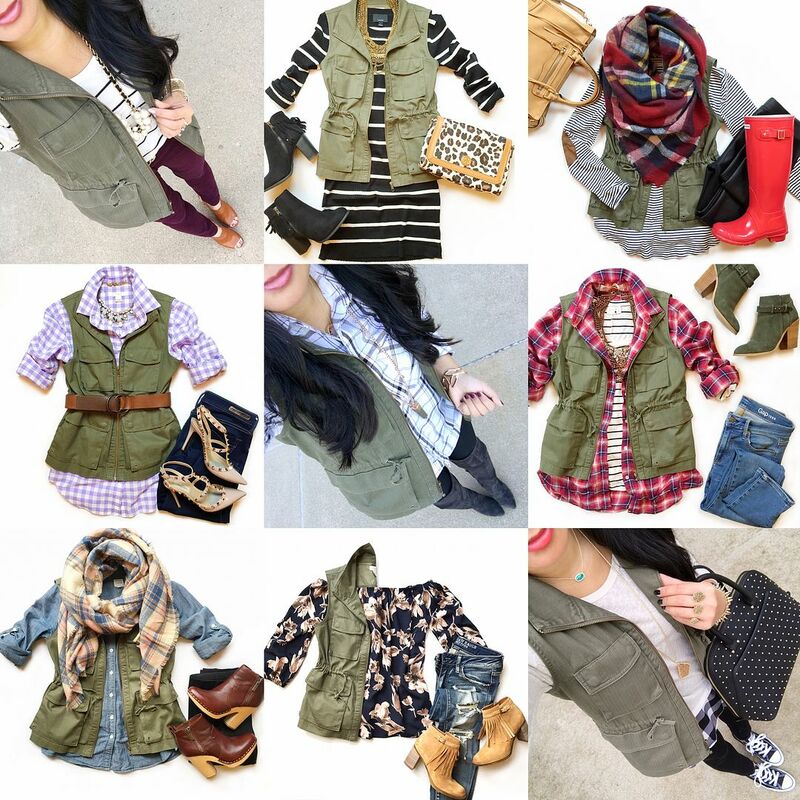 I've teamed up with nine other bloggers so you get our ten take on this year's fall pieces! If you missed last week's theme, you can get yourself caught up here! Today is all about our fall must haves! As I was pulling together ideas for this post, I realized that it would be a shame to not talk about my physical need for ALL THE UTILITY VESTS! It all started with the standard olive green color and it quickly escalated from there. Fall would definitely not be fall for me if I didn't have this super easy layer to add interest to literally any outfit. So, today, I have rounded up 22 ways I've styled each one of my vests. 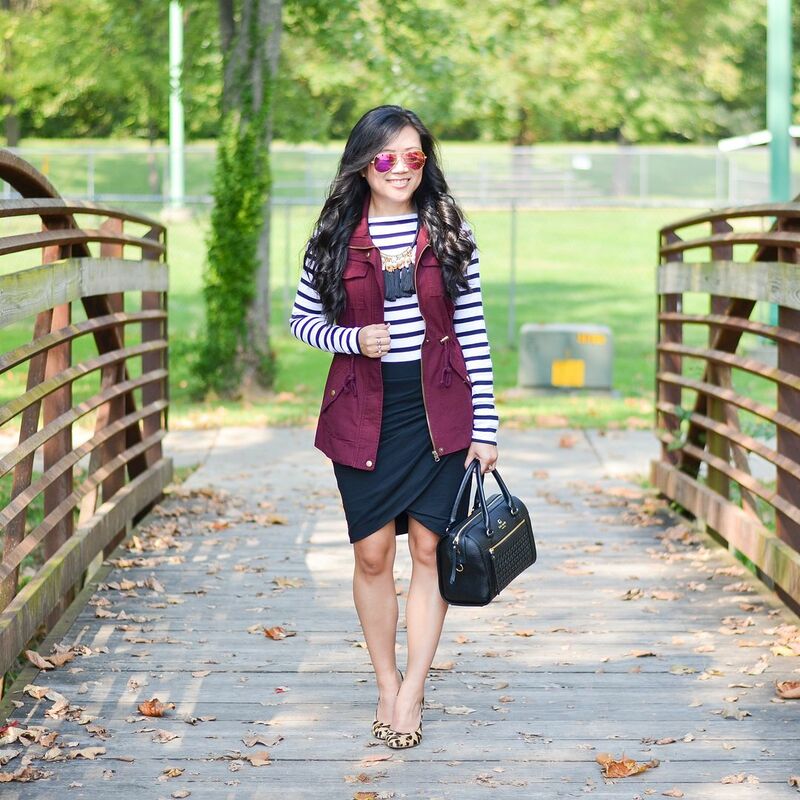 Just like I broke down last week's post, I thought I would phase this post, so to speak, so you can see how I slowly start integrating the vest into the season starting from when it wants to be fall, but isn't quite cool yet up to full on blanket scarf and pumpkin spice latte temps! For whatever reason, my khaki colored vest is the one I pull out the most at the start of the seasonal transition. There is something very summery about it, but the extra layer in and of itself still makes it inherently a fall piece. When I pull together outfits for this vest, I naturally gravitate to blues (even chambray) as well as cognacs. The outfits definitely end up having more of a safari vibe to them, which certainly is not a bad thing! As with my other vests, it's very easy to add a print because the vest will instantly ground the look - even when you want to wear more than one print with it! Ahhh, the wine colored vest. This is the newest in my collection, and I am not quite sure how I survived without it. This is one of the best colors to start wearing at the start of fall because you can't help but to FEEL fall-like when you are wearing this color. Plus, it's very eye-catching and I'm convinced that this rich color gets everyone excited for fall fashion! If you are not in the mood for fall yet, you will be once you start pairing this with other pieces in your closet. Gingham is one of my most favorite prints to pair with my wine colored vest! The same goes for leopard! And - if you're really daring, you can pair both gingham AND leopard in the same outfit. It works, I promise. It's very easy to pair your wine colored vest with all your standard neutrals like chambray, cognac, and black, but don't forget that it also plays quite nicely with olive! I love letting the vest be its own pop of color in the outfit, but it's fun to fool people into thinking it's a jacket by pairing it with the same colored long-sleeved top! 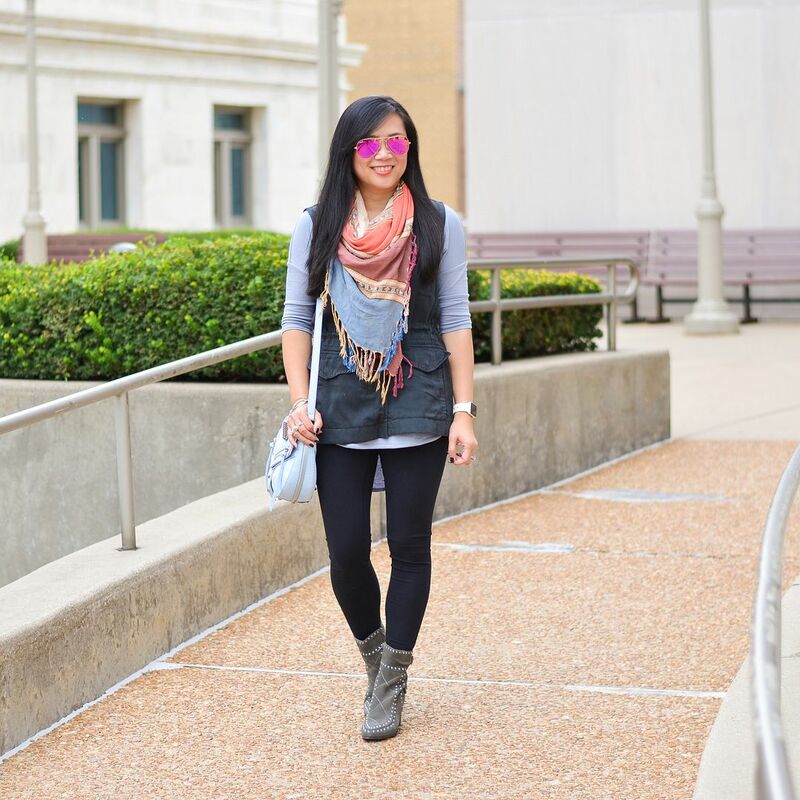 I always think about wearing my charcoal colored vest even more when the colder weather has beat me down a bit and I'm craving warmer temps again. Perhaps it's my mourning piece? Ha! I am not sure. But it's a great color to have around when you feel like you've worn your other ones to death. I realized that I tend to go more monochromatic when I'm wearing this vest. I'm not sure why! It really would work well with contrasting colors also, but I tend to grab my faded black skinnies when I want to wear this. White skinnies and a bright colored plaid top would be another option if you don't want to be dark and dreary in it like me! I can't pinpoint an actual time in the season when I wear the olive version of my utility vest because I truly wear it year round. It is such a work horse staple for me, I would be mortified if anything were to ever happen to this! Truly one of my most prized wardrobe possessions. I remember a time when I had zero ideas on how to style it. Nowadays, it's hard for me to think of ways it WOULDN'T work in an outfit. And the olive color is just so dang versatile! 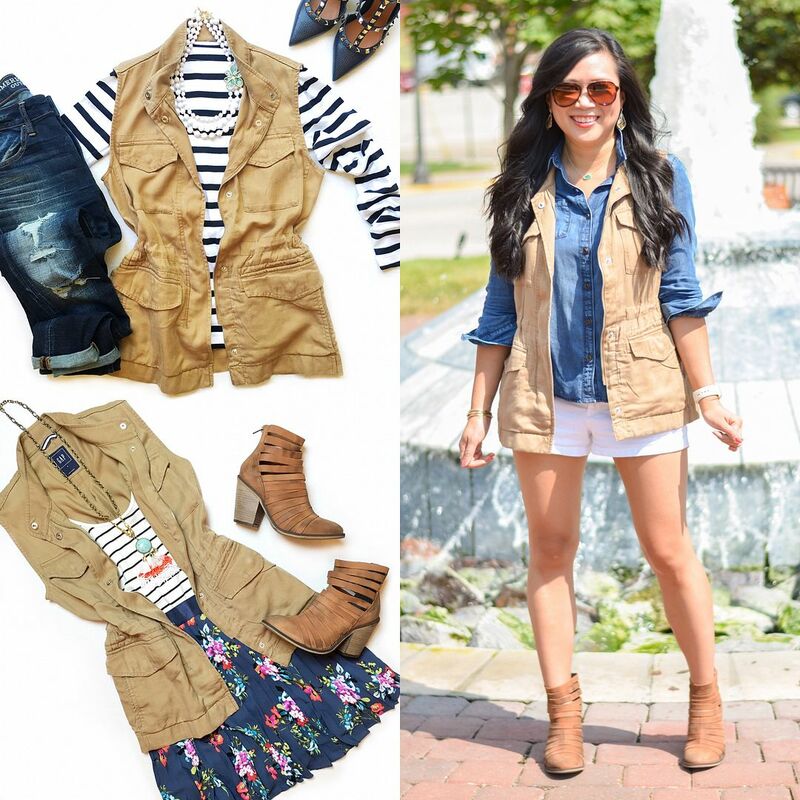 Lots going on in this post, but hopefully you found some new outfit combinations for your vests! I also hope I've given you reasons to buy the utility vest in multiple colors! You won't regret it! 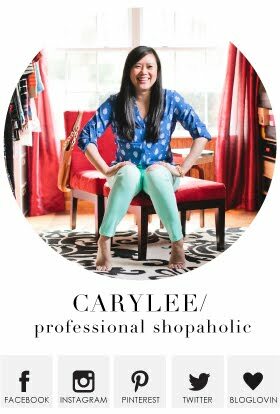 Please be sure to click through the other bloggers' posts to see which pieces they must have for fall, too! So funny bc Rachelle's post just made me think how cute vests look with dresses - and now you've cemented my desire for a cute olive vest! You've convinced me I need a wine colored one! Now I need a beige one, your collection is awesome. I need to try gingham with my wine vest too. I could not agree more. ALL of the utility vests, please!! I live in my utility vests! I just got the burgundy one and I am in love! They are such great fall staples! How do I still not have a Utility Vest?? 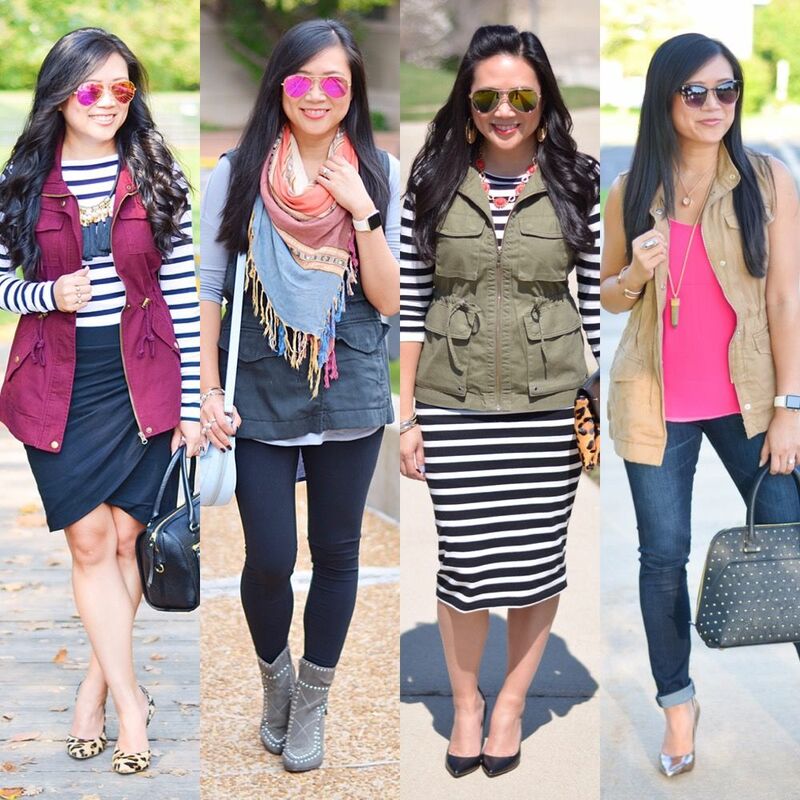 You have an impressive collection of vests and I am loving all of this outfit inspiration! I am loving all this inspiration! I definitely think I need to add a wine colored one to my closet now! 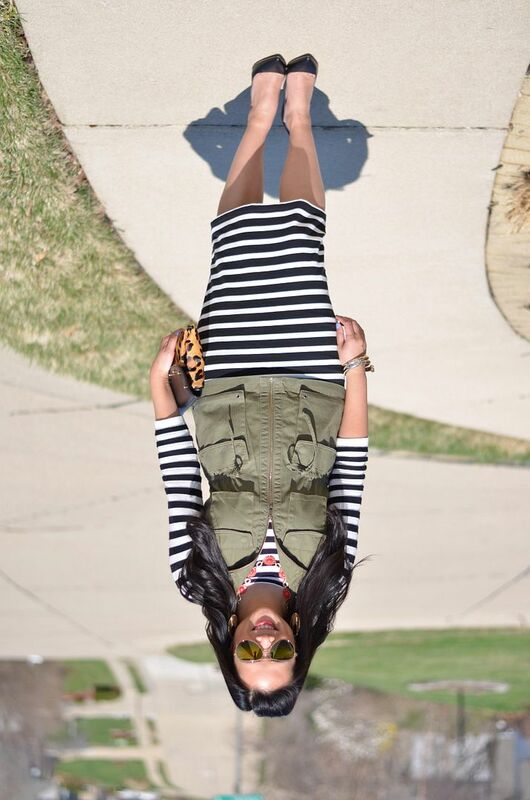 I love the ways you've styled yours! 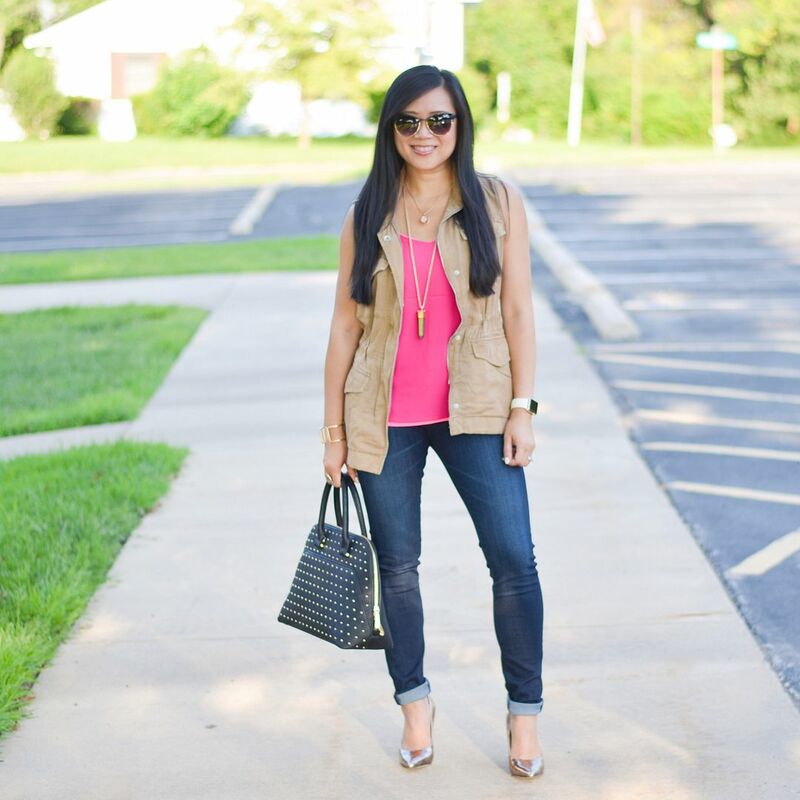 Yesss, I love the way a utility vest adds a shot of fall to a look- and it's a nice light layer for when the temperatures aren't yet too chilly. :) You look so cute in all these looks, doll! I love all your different colored vests! Love all the utility vests! Such a great basic that is definitely a must in my closet! I love the wine colored vest as well as the camel. It looks great every way you styled it! You are the queen of utility vests!! That burgundy one is a must have!! 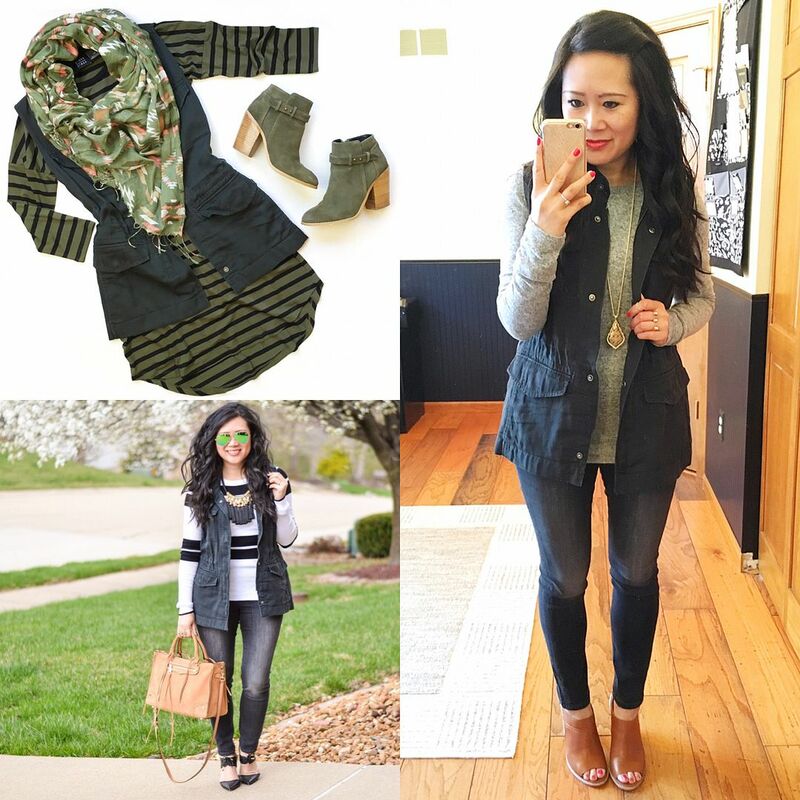 I only have an olive utility vest and I see now that I need to broaden my horizons! 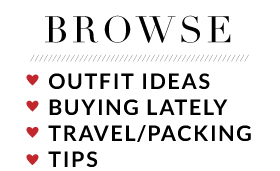 haha, awesome collection of style ideas! !